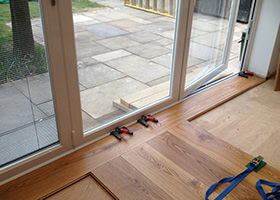 Finding a qualified wood flooring fitter can be a real challenge. Many people don’t realise how complicated fitting a wood floor can be, and can fall victim to unprofessional and unqualified carpenters. This can create unnecessary and avoidable problems with your floors. Your project may be delivered late – and you may end up with an irreparably damaged floor that has to be replaced. Our team of craftsmen have been carefully selected for their exceptional skills and extensive experience. We are members of the British Wood Floor Association (BWFA) so we are all qualified fitters who provide top-quality work. We always use state-of-the-art tools and materials and are constantly refining our skills to ensure the best service and results for our customers. The successful installation of your new floor depends largely on the condition of your sub-floor. That’s why at 3 Oak we have an experienced surveyor, using highly accurate equipment, to test and evaluate the condition of your sub floor free of charge before any installation work. 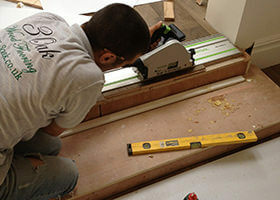 The survey allows us to identify any work needed on the sub floor and advise the best installation method to suit you. Oak is a natural material, so inevitably it has slight inconstancies and variations in grain and texture. This is what gives oak it’s character and visual appeal but can sometimes complicate the fitting process. When a new batch of timber has its finish applied there can be slight variations in colour. The difference is usually only very slight, even in the most extreme cases; nevertheless, when we lay a new floor one of our team of experienced fitters is always selecting boards to best match the wood next to it. This ensures the floor has a balanced, even look across its entire area. 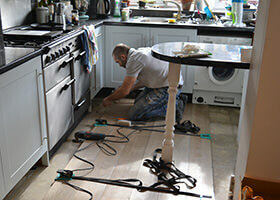 Our surveyors carry out a series of tests and inspections free of charge. The moisture level of the sub floor will be tested using industry standard equipment to be sure it’s within the acceptable range. The evenness of the sub-floor will then be assessed to see if any preparatory work is needed before the new floor goes down. After the load capacity is confirmed the sub-floor will be cleaned to remove any dirt and debris and be ready for the installation. During, and for a short time after installation, the room temperature must be a minimum 18°C and the room have a humidity level of 40-70 per cent. Using the information gathered by the surveyor, the team of fitters will have the knowledge they need to be able to lay the floor. Using the appropriate techniques and tools will ensure a wonderful result.